"Almost a blackberry cobbler but the dough is more of a dumpling than the other cake types I see everywhere. This is the recipe my great grandmother used for decades." Preheat oven to 400 degrees F (200 degrees C). Place a piece of aluminum foil on the bottom rack of the oven to catch any drippings. Mix 1 cup all-purpose flour, whole wheat flour, baking powder, salt, and baking soda together in a large bowl. Work 1/4 cup butter into flour mixture using your hands until about half the butter has been incorporated and the rest is in pea-sized pieces. Make a well in the center of the flour-butter mixture; add buttermilk to the well. Stir with a rubber spatula or wooden spoon until dough just comes together. Lightly dust a piece of parchment paper with 1 tablespoon all-purpose flour. Turn dough onto the prepared parchment paper. Shape dough into a ball; wrap parchment paper around dough. Store in refrigerator while preparing the blackberry filling. Mix blackberries, 1 1/4 cup sugar, and water together in a large bowl. Melt 2 tablespoons butter in a 10-inch cast iron skillet over medium heat. Pour blackberry mixture into the melted butter and bring to a simmer. Decrease heat to medium-low; cook and stir until liquid has reduced and is thick enough to coat the back of a spoon, about 15 minutes. 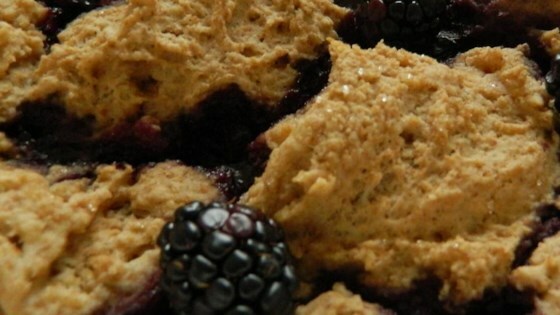 Gently drop large spoonfuls of dough evenly into the blackberry mixture; sprinkle with 1 tablespoon sugar. Bake in the preheated oven until lightly browned, 15 to 20 minutes. Remove from oven and allow grunt to cool for 15 to 30 minutes before serving.